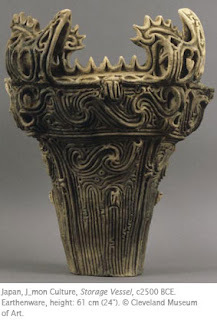 Most people think of ancient Greek painted ceramic vessels when you mention the word “ancient pottery.” What I think of are the sophisticated, elegant, and beautiful ceramic vessels of one of the oldest cultures in the world in Japan, the J_mon Culture. DID YOU KNOW that J_mon vessels, which were discovered in the 19th century, are the oldest ceramic vessels (not objects) in the world? The J_mon people had a continual culture that is believed to date back as far as 11,000 BCE and lasted until the first millennium BCE. Most Paleolithic, Mesolithic, and Neolithic cultures developed sophisticated ceramic and other art forms after becoming agricultural communities. The J_mon developed agriculture very late, and remained primarily a hunting-fishing, food gathering culture throughout their long existence. This makes the sophistication of J_mon ceramic vessels particularly interesting. Archaeologists generally consider the period 3000–200 BCE to be the height of the J_mon culture. The J_mon vessels are coil-built pots decorated with incised or applied decoration. The very term “J_mon” means “cord pattern,” referring to the common decorative motif seen on vessels from the Middle Period (c2500–1500 BCE). This vessel, from the Middle Period, is termed “flame-style” because of the exuberant decoration of the rim. J_mon potters seem to have delighted in exploring a wide range of decorative effects totally unrelated to the intended use of the vessel. This would mean the J_mon ceramics were the first vessels in history designed on an aesthetic basis comparable to the utilitarian. Cone-shaped vessels such as this one may have been stuck into the soft sand and used for cooking food. They were also used for storage in burials. It has been hypothesized that J_mon vessels were made by women, as were many ceramics in early human societies. Connections Across Curriculum - As the study of artifacts, archaeology gives students an opportunity to explore the world around them. Art, history, and science come together to give students a hands-on learning experience. Activities can include visiting a museum or National Park or interpreting objects in the classroom. The National Park Service “Archeology for Kids” website provides information, activities, and resources for educators. I find it very interesting that these pots were not just used for one particular function, but for both functional and ceremonial purposes. This seems to shows how deeply routed pottery and art can be ingrained in a peoples culture. Really cool!